Iron Sleek has increased to over 100 liner sizes in stock in the U.S. in and over 50 sizes in Canada! Park and Rec size liners are in stock up to full NHL sizes. Liners are now supplied in roughly 5 foot length increments up to 100 feet wide. This allows you to buy exactly the liner your need for your rink with minimal waste. Our liner selection has grown to meet our customers needs and budgets! We have everything. Feel free to give us a call to if you do not see the liner you require as not all sizes are listed. Iron Sleek manufactures the finest quality 6 mil, multi-layered, white Ice Rink Liner at the best sizes 25'-28'-30'-32'-35'-40'-45'-50'-55'-60'-65' wide as a single seamless sheet! We use only virgin polyethylene plastic resins (LDPE). NO RECYCLED MATERIALS, NO POST CONSUMER PRODUCTS ADDED, and NO INFERIOR MATERIALS...just 100% pure plastic sheeting that is specifically designed and reciped for winter ice rinks. Our seamless poly sheets are engineered to withstand the cold and do not crack while being 100% water tight. Our liners do not seep water while woven tarps do. Tarps are water resistant while Iron Sleek liners are 100% water tight...a true necessity for freeze/thaw conditions! We offer widths that are perfect for making residential ice rinks and commercial ice rinks to be 20 wide, 30 wide, 40 wide, 50 wide, 60 wide and even 80 wide to make things easy for you...minimal lumber cuts and minimal waste with Iron Sleek's optimized liner widths!! We also have enormous ice rink plastic sheeting to service our Parks and Recs customers. Choose a liner to be big enough to cover your entire skating surface and then some. 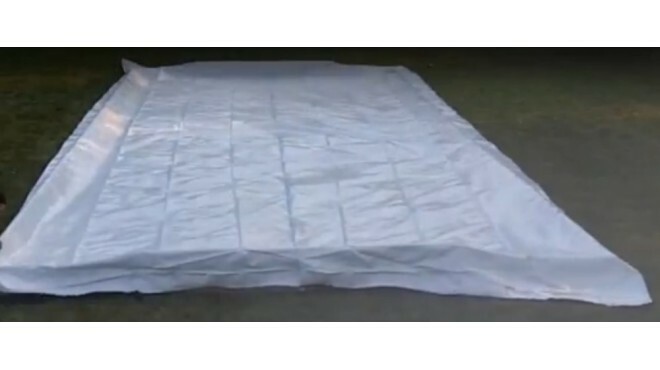 The 100% plastic ice rink tarp should reach all the way up your boards and droop down a bit. A great rule of thumb is to add 5 feet or more to the length and width. For ground that has a lot of divots and humps, be sure to add even extra liner because the liner will follow the contour of the rinks surface. For example, a rink that is 30 by 50 should use a plastic liner or tarp that is at least 35 by 55. It is always good to have extra liner just in case you need to use taller boards. Always error on having more liner because once the sheet is down and filled with water, it cannot be shifted. Utilize Iron Sleek Rink Topper to hold the liner in place and to give your rink a great appeal. A great way to get a discount on your rink is to consider a Rink Kit. Our rink kits come standard with Iron Sleek liners. Treat your liner very carefully when installing it. Be sure that nothing sharp is in your rink area or on your boards. Be sure that no screws are pointing into the rink interior as this is a very common mistake. If you have an oops, no problem as our liners come with the best super tape that will seal it water tight again. Fill the bottom gaps with soil and compact or use Iron Sleek Base Cove. Carefully unroll your liner and then unfold the width. Now, tuck your liner down gently into the rink bottom. Do not staple your ice rink liner until the water is fully settled around the rink frame. Iron Sleek Rink Topper is a great alternative to stapling. Try not to walk on your liner as it is key to a great skating season. Never reach into your rink enclosure with tools as this is a common mistake that rookie customers sometimes make. Tools can drop!! Our liners are packed in heavy duty boxes and our shipping rates are competitive. Enjoy the convenience of getting your ice rink products to your door step. We are the very best at successfully delivering service and product to your home. Call us for help or advice on your rink at any time. We are not just suppliers of ice rink products but are expert rink builders. Give us a call, 877-825-2334 to discuss larger sizes and string reinforced rip stop liners. We have it all! Our standard 25 wide, 35 wide, 45 wide, 55 wide and 65 wide liners are 1 piece, multi-layered and pin-hole free. NO SEAMS and WHITE! Only the best. "The guys at Iron Sleek were very knowledgeable. They helped me with many ideas for my rink. I bought a 40 by 60 ice rink liner from them that worked out awesome compared to the plastic tarp I bought last year. The liner was delivered to my doorstep in perfect condition and it came with a piece of underwater patch tape that came in handy. Next year I'm going try the Iron Sleek brackets. Thanks fellaz"